Tuesday July 17th 1900 Mort helped me do the washing. Leonard went to town with corn to get ground and Will cut oats. I worked the whole day long. part of the afternoon in the garden. It was such a nice cool day. Wednesday July 18th 1900 I had baking on hands in the forenoon and did not get my ironing done till in the afternoon. 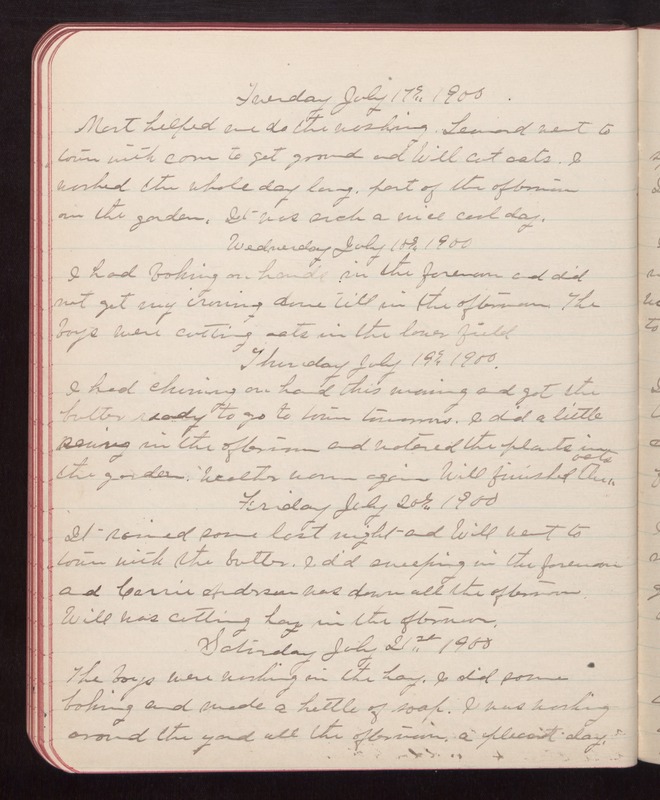 The boys were cutting oats in the lower field Thursday July 19th 1900 I had churning on hand this morning and got the butter ready to go to town tomorrow. I did a little sewing in the afternoon and watered the plants in the garden. Weather warm again Will finished the oats Friday July 20th 1900 It rained some last night and Will went to town with the butter. I did sweeping in the forenoon and Carrie Anderson was down all the afternoon. Will was cutting hay in the afternoon. Saturday July 21st 1900 The boys were working in the hay. I did some baking and made a kettle of soap. I was working around the yard all the afternoon. a plecant day.